We have a lot of special recipes in my family. 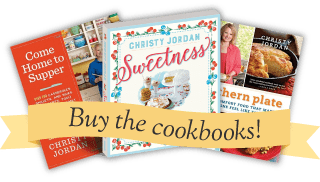 Heritage recipes that bring back sweet memories of my childhood, stories of my grandmother’s childhood, and even recipes from my great grandmother’s childhood. We cherish these and enjoy talking about the memories each time we make them. Today’s recipe, though, is even more special. This is a ceremonial recipe for us, one that marks the most special of milestones in our lives. This punch was served at my bridal shower, my wedding, and my baby showers. I made it for my parent’s 25th wedding anniversary and also helped make it for my cousin’s wedding. 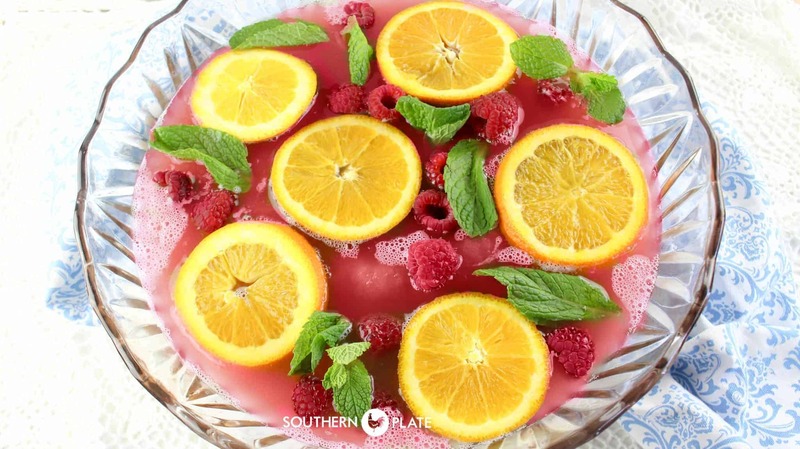 Whenever we have a special ceremonial occasion, this punch is made – and it makes the occasion all the more memorable because it is DELICIOUS. The ingredients are simple. Cranberry Juice Cocktail, Pineapple Juice, Ginger Ale, Sugar, and fruit items to garnish (if desired). 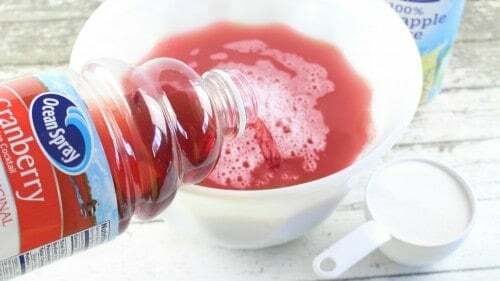 Combine Cranberry Juice, Pineapple Juice, and Sugar. Stir until sugar is dissolved. This makes your punch concentrate. 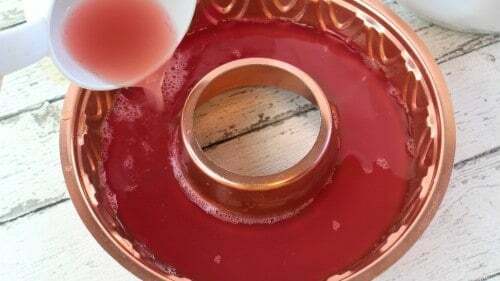 Take a little bit of that concentrate (about 2 cups) and pour into a ring mold or ice cube trays and freeze. The rest of it, we put in gallon jugs and place in the fridge until we are ready for it. Usually, we have to take it somewhere so keeping it in gallon jugs makes that easier. When ready to serve, mix one recipe’s worth of punch concentrate with 2 liters of Ginger Ale. Add a few drops of red food coloring if need be to get it to the desire color*. Add ice ring and garnish with fruit slices and berries, if desired. *In the old days, this punch was always a pretty pink color. However, with less artificial dyes and such in juice these days, the color may be more murky and require red food coloring to make it pretty like this. If you are traveling with the punch, take a little bottle of red food coloring with you just in case. 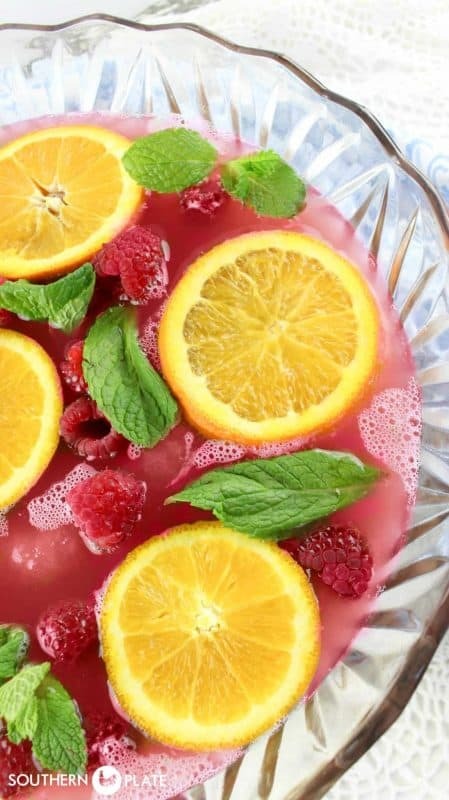 This punch is so very delicious and has been part of many wonderful baby showers, bridal showers, weddings, and anniversaries! Combine sugar, cranberry juice, and pineapple juice. Stir until dissolved to make punch concentrate. Pour about 2 cups of the concentrate into a ring shaped ice mold or ice cube trays and freeze (do this if it works for your photos, if it doesn't no worries) Refrigerate the remainder of the concentrate and refrigerate unopened ginger ale overnight. When ready to serve, mix refrigerated punch concentrate with the ginger ale in a punch bowl and add the frozen punch concentrate on top. Add a few drops of red food coloring if needed. Garnish, if you like. Wow ! This look’s so pretty , and easy to make , ty for posting it. Thank you Dianne!! I hope you get the opportunity to try it soon! How many servings will this make? It sounds delicious and I have my son’s anniversary coming very soon. Can less sugar be used? Ohh, yours sounds good too!! 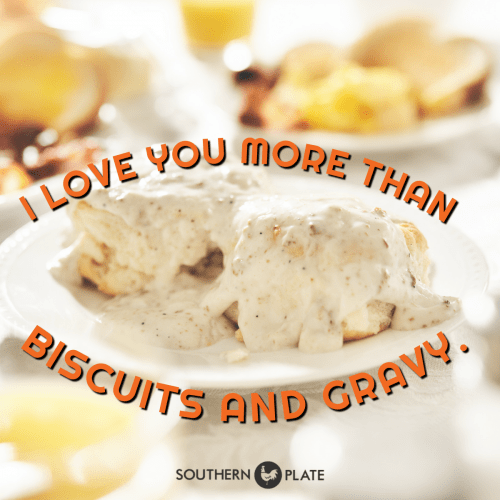 I love you more than biscuits and gravy should be the title of your next cookbook ! Thank you for sharing your recipes. I can always find something really good to make for my family. Can this be made with sugar free items and splenda? I use (1)Kool-aid pack (with sugar), (2, two-liters) ginger ales or (sprite), (1) can pineapple juice, (1) frozen orange juice (concentrate with 3 cans of water) and (half gallon) orange sherbet. 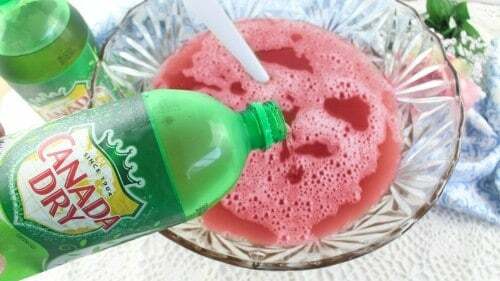 This was always our family punch as well. My Mother made some for my Dad’s “39th” birthday party (celebrated every year) and had some left over. She froze several batches in 5 gallon ice cream containers. She thawed one 2 weeks later for my brothers 8th birthday and just before the party, realized that this batch was spiked with vodka! Disaster and upset parents averted!! It does freeze beautifully even with additions. Oh my goodness, how funny!! Glad that was caught before hand!!! What a lovely story! What a lovely punch! Baby shower for my nephew and his wife coming up in July. Traveling to Minnesota for the shower. Love the idea to pack in gallon jugs. Definitely gonna make this. Thanks! Thank you Deanna, I hope y’all have a wonderful shower and the punch is a hit!! Can someone share a green, “Wicked” colored punch? Christy! I found you on IG a couple of weeks ago and I believe we were separated at birth, except I’m too old for that! 🙂 You are so witty and a girl after my own heart. My husband and I celebrate 40 years of marriage this coming Sunday, June 11th. I was 19 and he was 20 when we married, just babies…but it “took” and I am so thankful. I have a mentoring-in-the-kitchen ministry called “Tasting Grace” where I teach cooking and life skills to some young women in our church and community. It’s so much fun! A friend of mine and I co-authored a book on this fun ministry called “Tasting Grace” you can find on Amazon and Christian Book Distributors. I think you’d like it, sounds like you! Anyway – God bless you and I may need to make a batch of this punch to celebrate 40 years, 2 sons, 2 daughters-in-love, and 5 grandyounguns. Oh my goodness, CONGRATULATIONS on 40 years of wedded bliss!! I will look for your book, I love that you use the kitchen to bless and mentor, I can’t think of any better way!! Christy, I have gotten so many good ideas/recipes and good feelings from your site over the years but have never really shared much so I think it’s time I finally pay you back just a wee bit! I saw this post and it sounded so much like our family’s punch recipe we’ve been making for over 40 years that I thought I would share our variation with you to try sometime: 4 cups of cranapple juice, 1 1/2 cups sugar, 4 cups of pineapple juice and 1 Tablespoon (yes, that’s right-it’s the magic ingredient!) of almond extract. 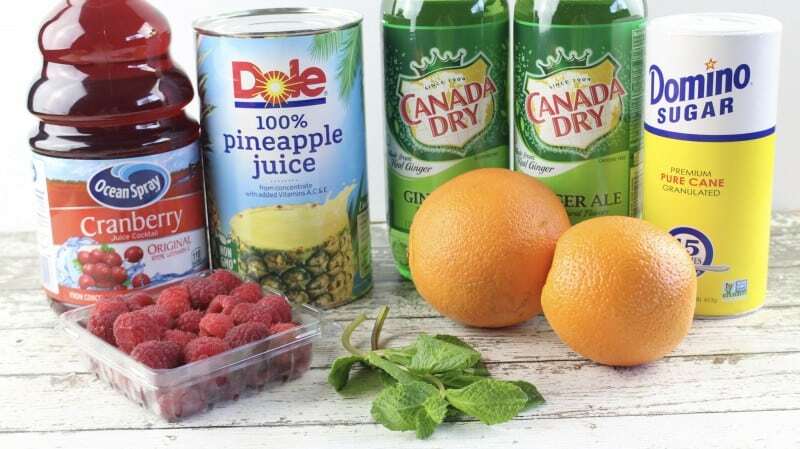 Mix this all together and either put in punch bowl with 2 quarts of gingerale OR freeze and serve just like your recipe. Thanks so much for all you do and all the good feelings you put out onto the internet – it needs more people like you! Thank you for sharing Penny, I can’t wait to give yours a try!! You sweetness just plows thru every sentence, you seem so ‘real” . Have a great week. Thank you Mary!!! I hope you have a great and blessed week!!! Thank you Boyd, I hope you enjoy the punch! !